Every day I look across the way to the Col. C.T. Herring Hotel. 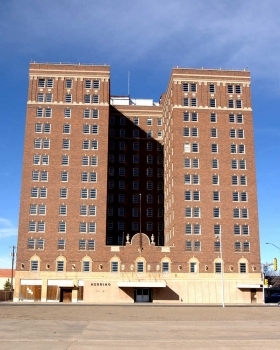 She is the 14 story, 600 room Grand Dame who sits on the corner watching people scuttle by and ignore her inevitable decay. She was born in an era when the Cattle Barons still ruled the plains and the oil tycoons purses were heavy with black gold. 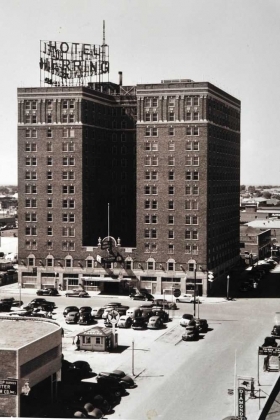 Businessmen and bankers would discuss business in the hotel’s Old Tascosa Room. I wonder what secrets were told. The lady stood through the Stock Market Crash of ’29, WWII, Korea and ‘Nam. She’s watched as ﻿black and white children, once segregated, came together. Her structure never faltered as Kennedy, Malcom X, RFK and MLK were assassinated. As the wall in Berlin fell, hers stood firm and on September 11, 2001, I swear you could hear her mourn. She’s seen the the radio, television and movies transcend from silent films to iMax 3D. And communications improved from the telegraph to the switchboard to universal and satellite cellular service. What hasn’t she seen? She’s seen the best and the worst mankind has to offer and still she stands on the corner just watching people scuttle by and ignore her inevitable decay. As she stands today – not the most attractive view. The view I have of her is actually between some trees and a much prettier shot. ﻿The old hat check room remains as it was left. Nails in the wall to hold cowboy hats. The coffee shop still has brandings on the walls representing ranches in the area. After the death of Colonel Herring, his wife moved to one of the top floors where she eventually passed as well. I write about the Grand Dame today because the city is changing – and in my opinion, not necessarily for the better. There is an effort to “revitalize” downtown and to make it something more than it is now. This cow-town could stand for some revitalization, but not what the city has in mind and not at the cost. I sincerely hope with all of the changes this town is about to thrust upon downtown, she can withstand them all – just as she has withstood all of the other events through her history.